Students will understand that some animals hibernate. Students will learn that hibernation is different than sleeping. Students will learn that there are different kinds of hibernation. Students will demonstrate active listening by asking and answering lesson-related questions. 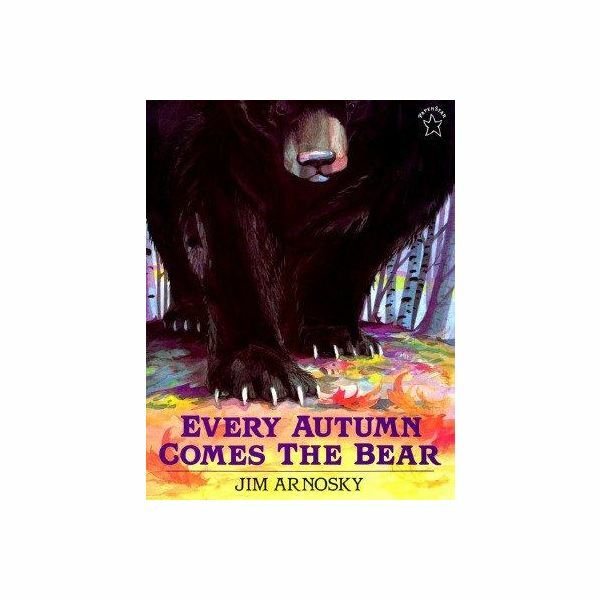 Begin a unit on hibernation or a study of bears with Jim Arnosky’s Every Autumn Comes the Bear, which has simple text and striking illustrations. Read through one time and then return to the beginning to discuss some of the vocabulary and book content. 1. Why do you think the bear comes at the same time every year? 2. Why do the animals hide from the bear? 4. How do the book’s illustrations show the gradual change in weather? Turn the bear facts into a measurement activity for your students. To measure the length of a black bear use rulers or student-made “feet" placed end to end on the floor. Divide the class into two or three small groups so that everyone can be involved with the measuring. Black bears can be 4’-7’ in length. For comparing the weight of a black bear to the combined students' weights bring in a home scale and weigh individual students (those who wish to participate). Then add the weight of each student until it reaches the weight of an average bear. Have those students stand close together and try to understand with this visual how heavy the bear is. Ask your students what options animals have when the weather turns cold. Some migrate or move from one region to another according to the seasons. Some animals may adapt to the cold weather and continue to search for food. These animals may grow heavier coats of fur when it is cold or even change colors to blend in with the winter environment. Some animals may prepare their bodies for winter by building up their body fat and then going into a deep sleep. Who Sleeps and Who Dozes? Most people think that bears hibernate. But there are different forms of hibernation. True hibernation means that an animal is in such a deep sleep making it nearly impossible for it to wake up before it is time. The heart rate of the hibernating animal drops to an extremely low rate. Also the body temperature drops dramatically. Woodchucks, ground squirrels and some bats are true hibernators. Bears, skunks, raccoons and opossums are not true hibernators. They tend to be light sleepers and wake up sometimes to find food. However these animals do have lower breathing rates and body temperatures when they take a long nap. Cold-blooded animals cannot protect themselves in cold weather so they need to find a place that can help them maintain body temperature. Many find shelter underground, in the bottom of a pond or huddling together in a hollow log. Compile a list of animals from which you can assign one to each student. The student should research what the animal does to survive in the winter. Research can be done using non-fiction books and encyclopedias at the library or with appropriate online resources. From that information, the student should create a project to present the information to the rest of the class. Suggestions could be making a poster, diorama, a student-created board game or a puppet play. What If You Had to Hibernate? A lesson plan on Every Autum Comes the Bear would not be complete without writing about hibernation as autumn turns to winter. As a writing assignment, ask your children to write about what they would miss if they had to hibernate during the winter. What things would they not mind missing? Describe the environment they would need to hibernate. Brainstorm things they do in the winter before they write: school activities, sports, outdoor activities, indoor activities, hobbies, and so on. Arnosky, Jim. Every Autumn Comes the Bear. Putnam and Grosset Group, 1993. Latta, Sara. What Happens in Winter? Enslow Elementary, 2006. Crossingham, John. What is Hibernation? Crabtree Publishing Company, 2001. Perry, Phyllis. Animals That Hibernate. Franklin Watts, 2002.